Collaborate has three user groups that come together to create the largest user group events of the year. This was a year of change, not only the venue but also the user groups themselves. 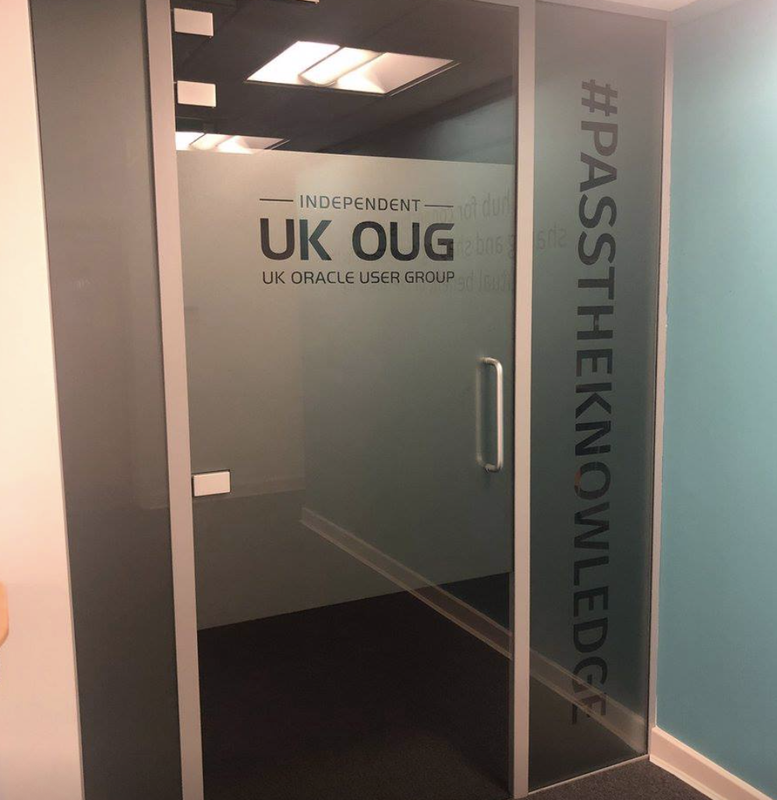 IOUG joined with Quest, which I believe is a great way to safeguard the legacy of IOUG and to grow the reach of Quest. However I spoke to several IOUG people who think of Quest as being the home of TOAD rather than the user group. OAUG changed their name to OATUG to include technology. I heard somewhere during the week 40% of the content is already technology, it probably is, but the technology they cover is dedicated to that used with E Business Suite, so I’m not sure if I was a technology person I would know whether the content I want is covered by IOUG through Quest, OATUG or ODTUG. 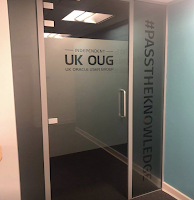 I believe user groups do need to be refreshed and restate their objectives, and I was very pleased when at the end of last year UKOUG tweaked their brand by adding the very important independent to the name. I was very proud to have led that part of Project Reach before I left the board and love that they have decorated the new building with the mission statement as well. Emerging technology is something that all the user groups have to do with all the time and it’s a guessing game as to how much and when I’ve often talked about the gap between Oracle Marketing and full-scale uptake in the user base. 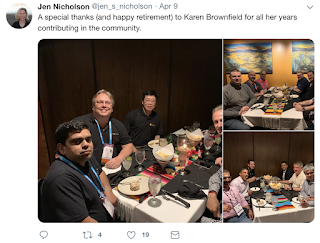 At first it is easy to get presentations from Oracle as they promote the new products and then as early adopters appear they are in great demand for their story but we must quickly provide content for those who have actually moved. In my area of SaaS, I think many user groups including UKOUG and those at Collaborate are struggling with this last category. The number of customers who are now using cloud applications is high and yet there is very little content about the things that are important to them, the update cadence and the new functionality delivered that they have yet to switch on. There is plenty of content for those thinking about going to cloud. We also need to ensure we have content for those staying where they are, which Collaborate did well and UKOUG have an event in June. The same problem is true of PaaS, in ODTUG, middleware lost it stream a few years ago as attendance wasn’t high but hopefully now the new emerging technology stream will address this. I have a session this year on VBCS. I don't have a quick answer, but perhaps user groups need boards or advisory teams that represent all the communities. There are many of us in the user group communities who are traditional and old school. That may be where the passion is but is it totally representative? Collaborate for the first time in ages was not in Las Vegas which really pleases me although it is back there again next year. This is the biggest user event in the calendar and I had 5 sessions, across the 3 uaergroups. I was part of an OAUG Cloud Panel facilitated by Alyssa Johnson and it also included Mohan Iyer and Alfonso Pinan from City of Atlanta who had previously shared their story at OOW. This was a good session and showed the interest from users. Later in the day I facilitated a panel session on Community, which was the idea of Jennifer Nicholson who runs the ACE Program. Also on the panel was Michelle Malcher, Karen Brownfield, Mia Urman and Opal Alapat. 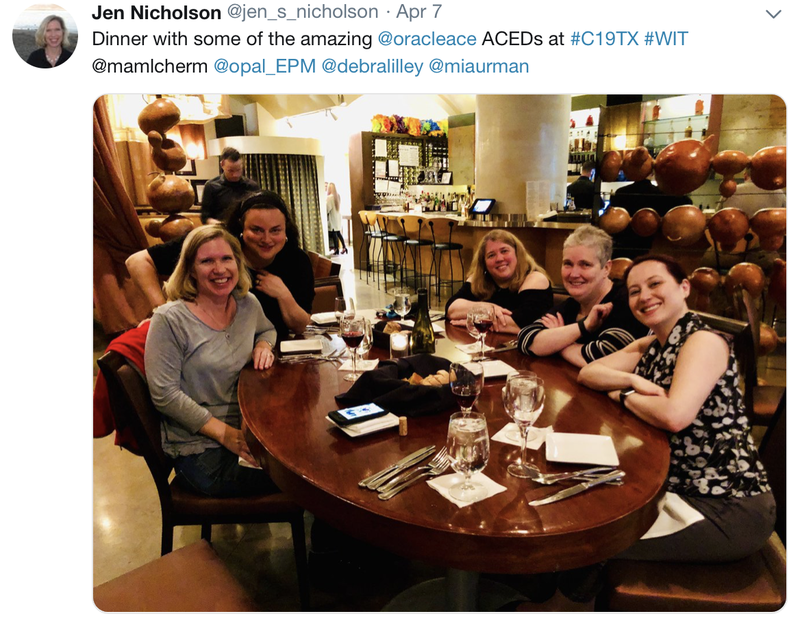 Everyone shared stories about how communities, especially the ACE program has helped their careers both privately and professionally. The ACE Program also launched a new ACE Directory. I spoke on 'Which Cloud Should I go to', this is my flowchart presentation based on the article in Oracle Scene. I am very passionate about this because I think Oracle have separate conversations with their customers and not a single strategy approach. I spoke to one customer who told me they had both their Apps Account Rep selling SaaS to them and their Tech Account Rep who wanted them to go IaaS, at Collaborate, entertaining them separately! I also gave my presentation on VBCS, which in Ireland last week I realised is more just an example rather than this actual example. In Collaborate it was the last session of the day and no one turned up. This is the first time this has happened to me and I was very disappointed. I know the session time is part of it (other people had no shows as well), but I also think I need to change the extract to reflect its true objectives. I also had an early session on Thursday, after the party Wednesday night, so I was worried it was going to be badly attended as well, but I shouldn't have worried it was a really big crowd. This was my Back to Basics session that talks about what is under the covers of Fusion. It may be true that you can't touch this but for those moving from on premise they do have an interest. I also got the chance to catch a session from my great friend Floyd Teter who is part of the Oracle HCM CoE. As like last year the User Group Royalty were together again. Thanks to Quest for sorting the room, Michelle Malcher, Sue Shaw and I were together again. I attended a session Sue gave on living in the cloud and it was excellent. 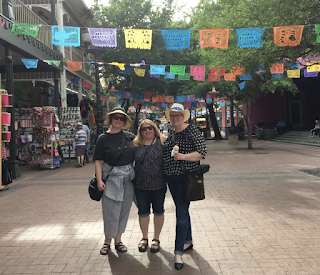 Networking was also fantastic, I had dinner with Jennifer, then the ACE Dinner, loved the big party although bowed out early and finished the week with a great night with Sue and Michelle with dinner on the River Walk after a bus tour of the city. Despite it being Las Vegas I look forward to next year. This was an in and out conference for me. It’s a two day event and this year it was the 15th Irish User Event and I have attended everyone. I even remember the board meeting when regional events were first suggested and I offered to champion this, my local event. I led it for many years and am still a volunteer under the leadership of Simon Holt. 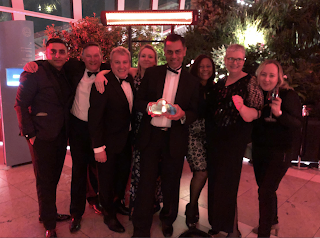 Unfortunately I could not stay for both days, I had to rush back to London for the Oracle Partner Awards, where Accenture had been nominated. John Able was the keynote speaker, and as ever excellent, he really understands this community. John and Tony Cassidy also had to rush back to London for the awards. I was there the night before and had an opportunity to have dinner with Alex Nuijten and to celebrate the recent promotion to ACE Director for Patrick Barel. Leaving early meant I couldn't be ring-girl for the 2nd bout between Alex and Chris Saxon, but Maria Colgan helped out, I'll be back again for the next one at Kscope in June. I had two presentations, Chatbots and Extending SaaS with VBCS. Both had a good audience and lots of questions. The VBCS was the first time I had given this specific example and the conversation was more about the principle in general rather than this use case. I managed to chat with Maria Colgan and then Tim Hall, and have a look around the very impressive exhibition hall. I hope to be back next year. 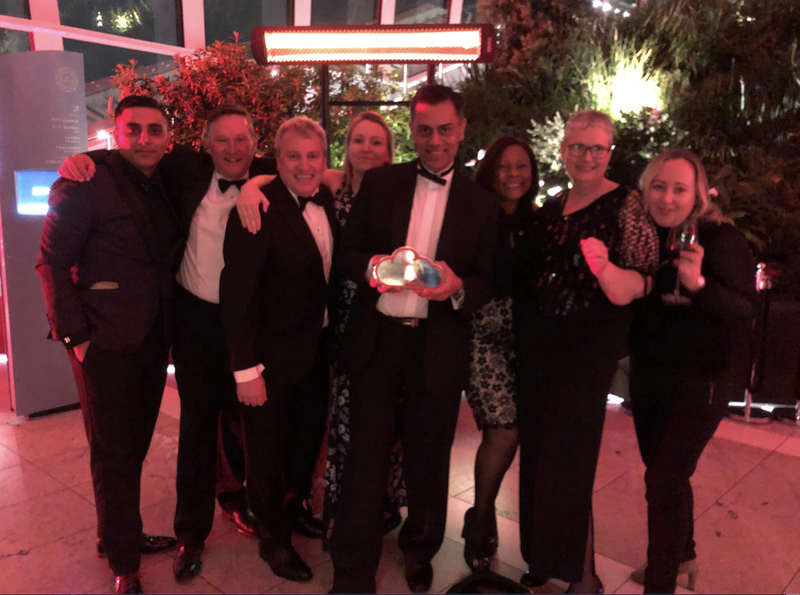 And as for the awards, Accenture won Cloud Implementer or the Year. Last Saturday I disembarked the Color Magic and the Norwegian Oracle User Group annual conference. Ever since then people have asked if I was on 'that cruise ship'. It wasn't, they were much further north and it appears much rougher seas. We did have terrible fog and missed under the bridge was poor visibility which is normally my favourite part of the trip, but this time it was watching the sunrise on Saturday morning. I love this conference and it was my 5th time. I previously attended first in 2010, then 2014, 2015, 2016, and most recently 2017. As I have a European role at Accenture I popped into the local offices before the event and love that their building is part of the Technopolis Campus built on top of the old Fornebu Airport Terminal. They even have the original badge reclaim floor in the restaurant. What a wonderful way to recognise the past. I stayed in a little hotel in Oslo - Guldmeden which Alex Nuijten recommended a few years back. Other speakers staying there were Stew Ashton, Francesco Tisiot and Christian Berg. I had 3 presentations. Should I move to Cloud, Extending SaaS with PaaS and Chatbots with SaaS. The last two much updated as the technology develops. As this was on board ship, internet is not a given so the demos were recorded, but my skills in that area are improving. I don't record as a video on its own, but simply without sound so I can continue to talk as if part of the presentation itself. I always get nervous when Product Managers attend my sessions, especially if we haven't spoken about them first. Geertjan Wielenga, PM of Oracle Jet was in my extend session, this is the technology behind VBCS. Afterwards he told me he liked my positioning of the different options and the use cases I gave. That always makes me feel appreciated. Being greedy and having 3 sessions meant I had one during the 4 hour stop in Kiel, Germany. I normally try to avoid speaking at this time as I like to have a quick run into town and have the obligatory currywurst and some quick shopping. However the only other slot available was at 6pm and that is when we go under the bridge which I may have mentioned is my favourite bit. This amazing Danish bridge is such an experience, so I decided to forgo the shopping. 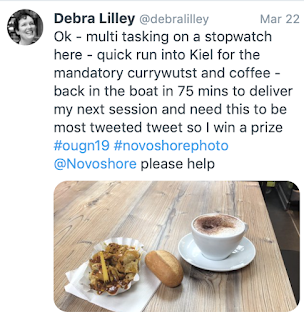 As the boat docked I was first off, almost run to the Bahnhof or train station and had my currywurst, I also took a selfie and tweeted as part of a competition for one of the exhibitors NovoShore. Love this idea, near shore resources for Oracle Maintenance and Development. Thanks to all my friends, I won the prize of a Norweigen Airlines travel voucher. I think I might fly North next year and try and find some Northern Lights. The Apps stream on the boat isn't too big and most users are staying on EBS but looking at how technology can help them, either replatforming on Cloud or developing outside. 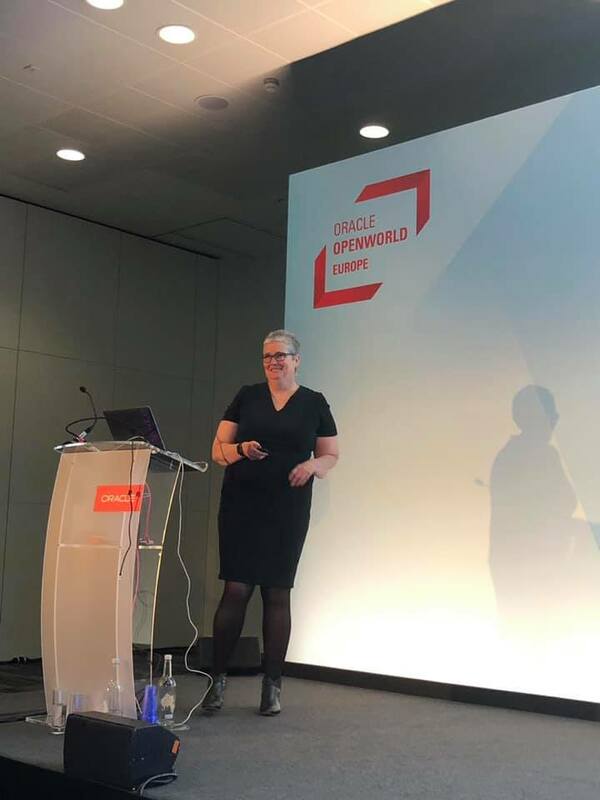 Turid Harborg, an Accenture colleague and Adrian Melsom, an Accenture Summer Intern (what a fantastic idea) talked about one such development using Oracle Jet. I didn't attend the session as it was in Norweigen but did get them to tell me all about it. I had a good conversation with one user who is happy with EBS but worried about being pushed to Cloud Applications, I was able to confirm Oracle has no plans to do that anytime soon. This conference cruise has a lot of networking including two amazing dinners but I chose to miss the Thursday night dinner as I felt a little unwell and had 2 sessions to present on Friday. However I was back in form and enjoyed the Friday Dinner. 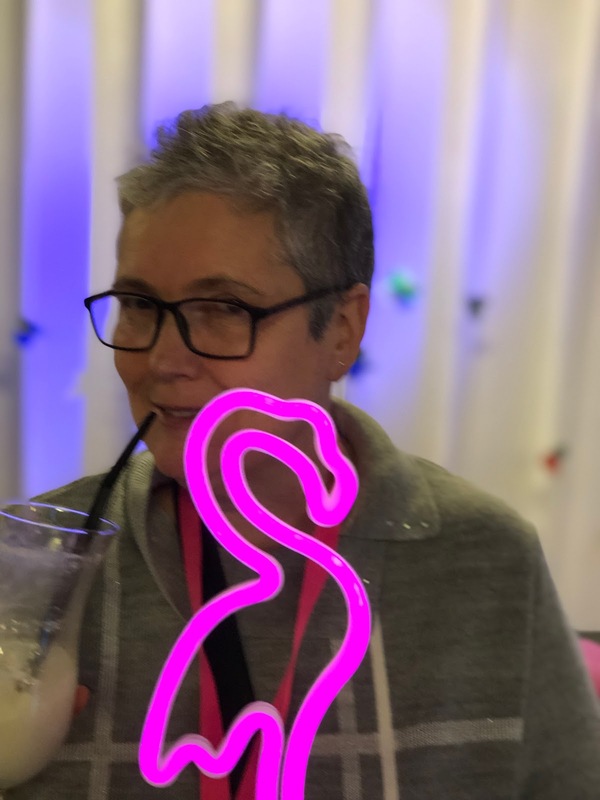 The theme for this year was 'Tiki Tours' and I'm not sure what the link between a Caribbean and a Norweigen cruise is, but I loved the effort they and the exhibitors put into it and I loved the cocktails especially. Then it was off to bed before the after party started as I wanted to get up early to see the sunrise having missed the bridge in the fog!! 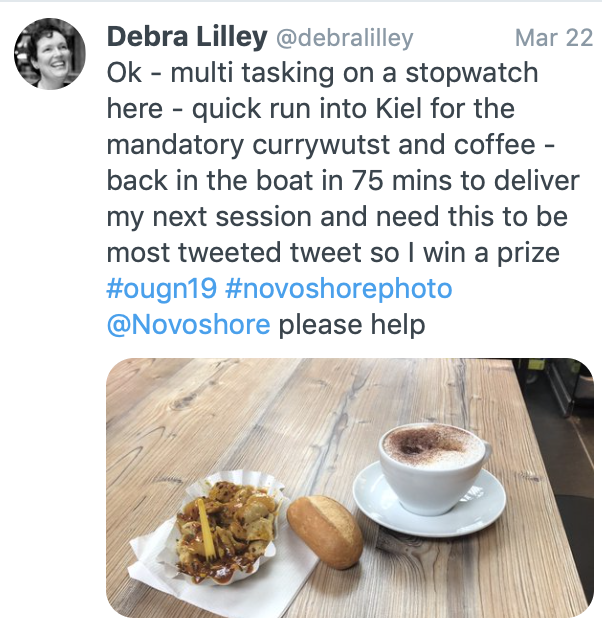 However I should have attended as I kept getting messages to tell me I have won the prize. After the uneventful disembarkation, I said my goodbyes and spent a lovely few hours in Oslo before flying home. This is an amazing conference, both the content and the experience. thanks to all who made it happen and to those who attended my sessions. Thanks especially to my employer for the time and the ACE program for funding. 'I'm not technical but.............' that's how many of my presentations start. Occasionally someone would say I was, and I'd just laugh it off. A few weeks ago someone I really admire, asked me to if I wanted to be considered for a Women in IT celebration panel. I was really honoured to be asked. However the response I got when I said yes, was a surprise," but you can't say you're not technical". 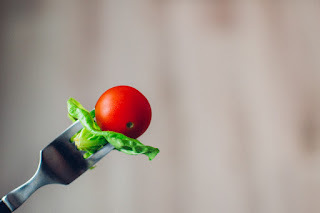 She also shared with me a blog post 'If You Can Use A Fork You're Technical' by April Wensel. I thought about the post, and I agreed with it. April says "Therefore, when we say someone is “technical” or “not technical” or “not very technical,” we’re communicating virtually nothing. Everyone is “technical” by some definition in some domain and is capable of learning other technical skills in other domains. Being more precise in our language will improve our communication." I used to be technical, I started my IT career as a Cobol programmer (I'm too old to be a developer). I've shared how I got into IT before, it wasn't exactly planned. And I think that was the start of it, I always had a little bit of feeling a fraud. I've spoken at STEM events and that made it worse, I left school at 16, no IT degree for me. 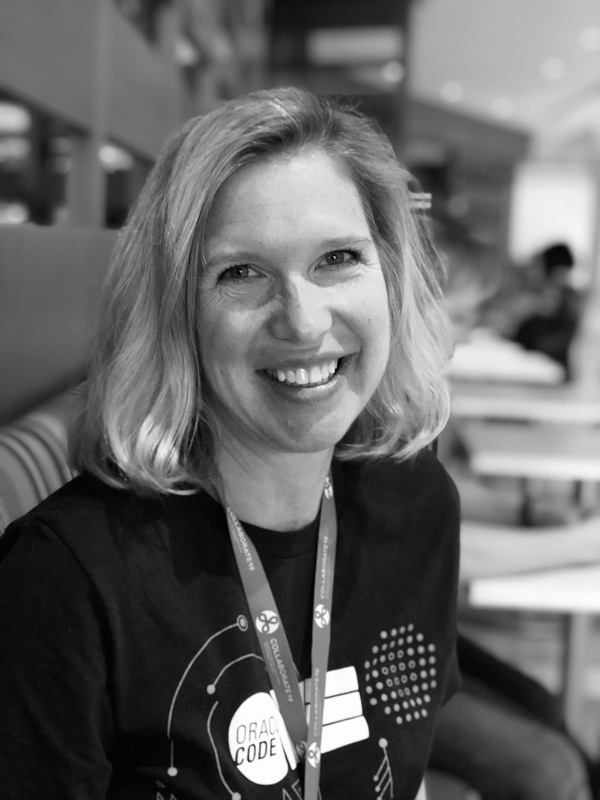 I was good at programming and then analysis, but it wasn't what I wanted to do, I wanted to work more at the strategic part of the process, helping the customers understand what they needed and how IT could help. And even though I didn't think of myself as overly technical I very much agree with the Women in IT initiatives, as long as they are to encourage women, not simply to moan. I have been blessed I've worked for people who allowed me to find my role and whilst sometimes difficult to articulate, I have always added value and been encouraged. I have been told, my role doesn't constitute being technical and I guess I just accepted that, but actually, more people have disagreed and believe I am, and laugh (or sigh) when I say I'm not. 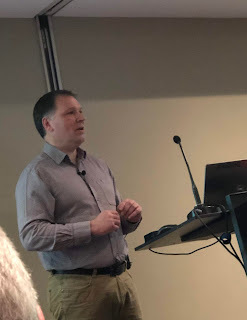 My skill is in understanding the technology, not just What it Does, but How but it does it, and then being able to articulate that to any audience, technical or business user and any level, beginner to C Level. Alex Gorbahov was the first person to articulate this in Australia 10 years ago. Then I have also been recognised by Oracle not only as an ACE Director but with an award in 2011. I also believe that to be successful in IT you need to be able to work both deep in the technology and the business. 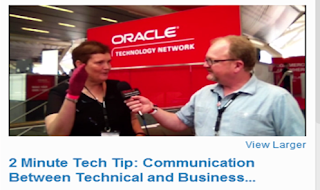 In 2014 Thanks to OTN and Bob Rhubart I had the chance to make a two minute tech tip video, and since I don't do technical, I took the opportunity to talk about the importance of IT & Business speaking, something that came up in my AppAdvantage session. (You need to watch it to understand why I am wearing socks on my hands). I spend a fair amount of my time understanding new technology, what sits under Fusion Applications and the PaaS to extend it. Then I make that real for organisations using Fusion Applications. 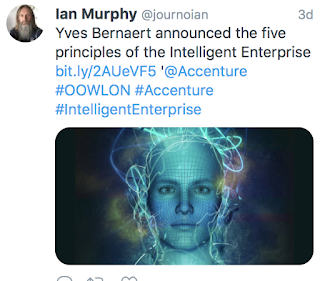 I guess you could call me a Technical Interpreter but that is a word I struggle to say quickly (I also can't say bureau properly either). So I'm going with Technical Linguist. 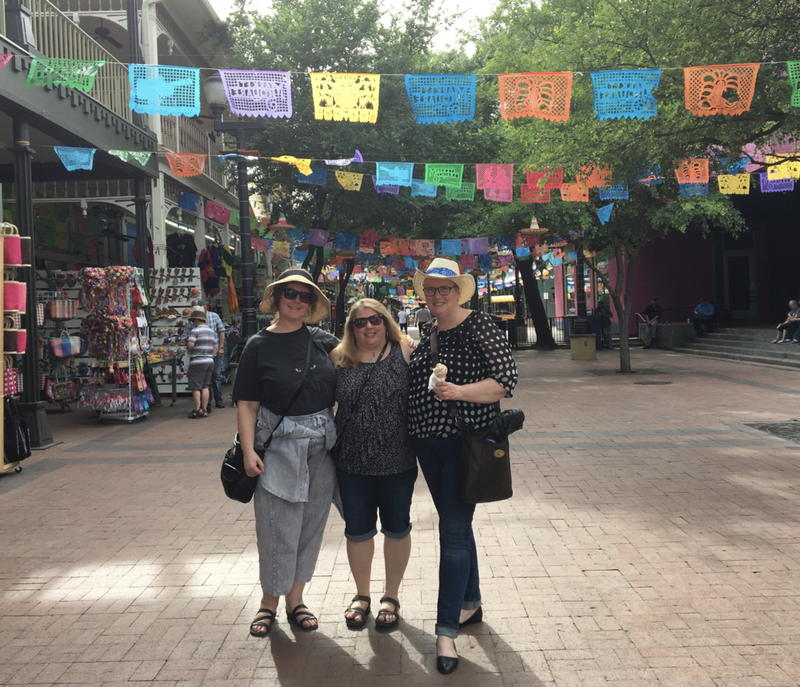 The journey to changing my profile, started with being sent the blog post, but that week I was at a Storytelling in Business Course and I chose this as my topic. As we went through the course I had to tell it 4 times and my colleagues were all so supportive, not only for the story but for the outcome. 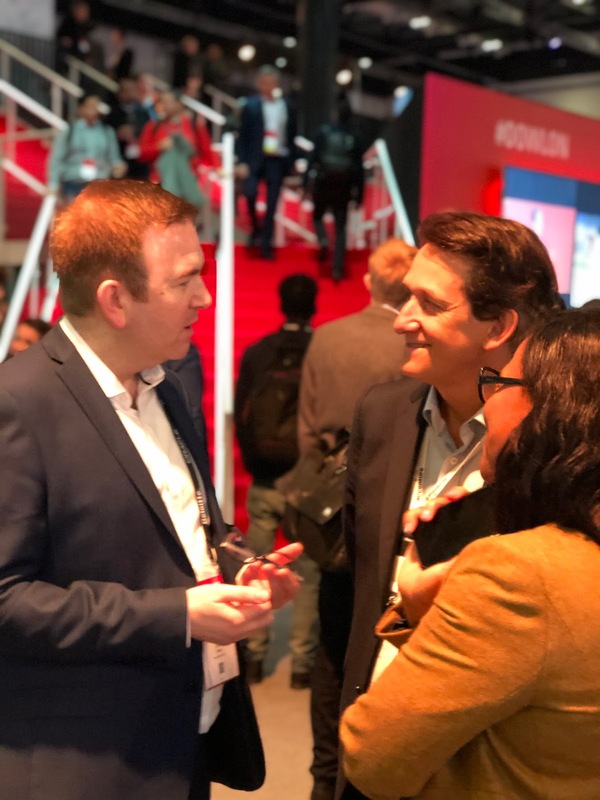 In the middle of January, Oracle brought Open World to London. I'm not sure it is actually Open World but it was a great event and much appreciated by those in region. For me it was my first outing as Accenture in action. We started in Accenture in October just a few days before Open World in San Francisco and although I was really welcomed felt I was still one step removed. Wind on less than 4 months and its a completely different story. Here I was part of the Accenture team responsible for the booth content. 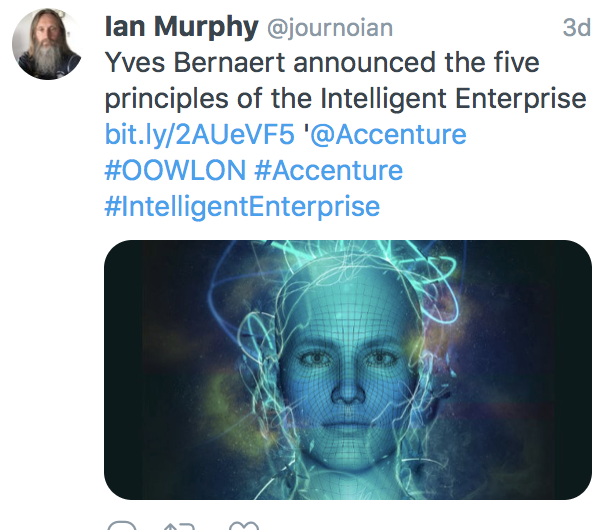 I actually spent Christmas week watching Accenture videos I had never seen, selecting content for a video loop, but it accelerated my learning. I got to work with Accenture Alliances, Marketing, both UK and Global teams. It was very stressful but I knew it would be fun. Just 4 weeks ago I was posting about having a less stressful UKOUG and here I was front and centre of the action at another event. Obviously no rest for the wicked! Accenture were a major sponsor and had a large stand on the floor, as I was also speaking and having customer meetings I was only on the stand officially the first morning,, but I was back whenever I was free. We had the WeDo team on our stand and I love how they bring the PaaS to life. Accenture also have a non powerpoint way of taking about what we do as well. This MyConcerto was launched at OOW in San Francisco and I'm looking forward to using that more in my day job,. 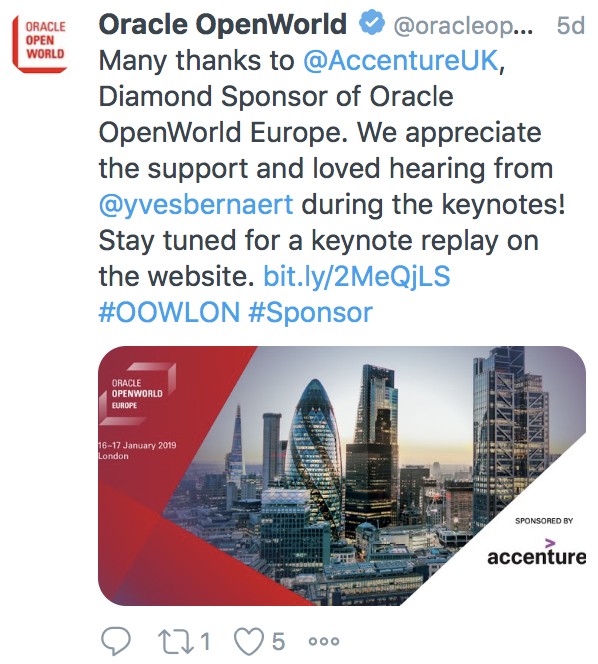 As well as Yves, Accenture also had a place on the Security panel and sponsored both the ERP and HCM solution keynotes. My colleague Lucia spoke on ERP with her customer Dean Sweet from West Midlands Police. West Midlands Police have implemented both ERP & HCM to support their Shared Service. However not all their information is held there, some is still in specialist, industry or shared solutions which are somewhat static , so they use RPA to run reports from those frequently and expose all the information through a number of portals created using Oracle CX cloud. This gives them information in minutes and all has been checked by their officers. Read more about this story in an interview Dean gave to Diginomica. (although they exaggerate a bit, it talks about £30m savings and I thought Dean said only £28.5m). The HCM keynote was led by Chris Leone who heads their development organisation. He talked about the innovation Oracle are delivering in the next updates and then my colleague Tim Warner tased about the pace of innovation and how to handle that. I then demonstrated some innovation Accenture are working on with Oracle PaaS, specifically Digital Assistants and our own MyConceierge. Finally Dean talked about how he is using the innovation implemented. 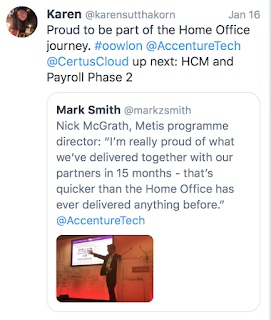 Other customers also spoke, Skanska on a HCM panel and the Home Office talked about their METIS project, where ERP is now live and HCM under way. Again Diginomica covered their story. The stand became a real hub, I met up with old friends and colleagues, including Viswa who I posted about previously, and got to meet lots of new colleagues, but what touched me most was old and current customers, throughout my 25 years in the Oracle world, making the time to say hallo..
My event finished with a back stage meeting with Eddie Izzard. Did I tell you I love my job? 10,000 people attended this year and I understand the event will be back again next year. I loved it and I hope to be part of 2020 too. Encouragement is something we can all give. It doesn't have to be formal mentoring, just encourage someone in their journey and help them find the right path. Many years ago, in 2007, I had the privilege of taking on a graduate in a new Business Intelligence Team I was building. I selected him because he pushed himself forward and said he wanted to learn. This was at the start of the learning revolution of youtube, whilst I was looking for traditional learning for him he was finding the content and just absorbing everything. I called him my human sponge. I was very proud of that team and missed them hen I moved into a new role 2 years later. Unfortunately my star pupil left after his graduate program, more because a traditional employer was hindered by process and unable to keep up with his phenomenal rise. Now Viswa is a senior manger and still going his knowledge. We have kept in touch, occasionally he still asks me for advice, and last week at Oracle Open world in London we had the chance to catch up. Encouragement doesn't cost much but the rewards can be amazing.